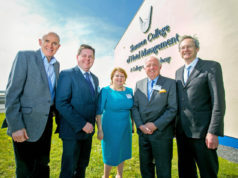 Some 101 graduates from the world-renowned Shannon College of Hotel Management – the only third level college in the country with 100% graduate employment since it was founded – received their degrees recently. And as they did, they were told by their Head of College Dr. Phillip J Smyth, what hugely enjoyable and rewarding careers lay ahead for them but, in a fast-paced industry, they must be conscious of their own and others mental health and wellbeing. Today’s graduates hailed from 10 countries including Ireland, India, China, USA, Seychelles, and Hungary. The college founded by one of the country’s great social entrepreneurs, Dr. Brendan O’Regan, in 1951 is a College of NUI Galway. 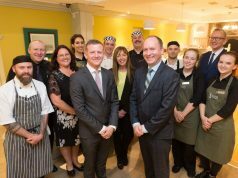 Graduating students heard from both Head of College Dr. Phillip Smyth and members of its alumni who have gone on to manage some of Irelands and the world’s top hotels.